ANAHEIM, CA - (July 15, 2015) - Anaheim Fire & Rescue, in collaboration with local key leaders in emergency services, have launched a new pilot program: the Community Care Response Unit (CCRU). 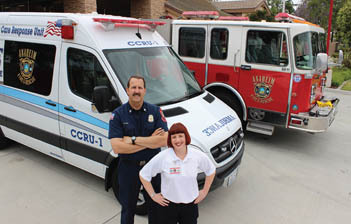 The first in California, the CCRU offers medical response to low-level, non-urgent emergency medical calls with an Anaheim Fire Captain/Paramedic and a certified Nurse Practitioner in place of the traditional paramedic engine/truck and ambulance response staffed with three or four fire personnel. In 2014, Anaheim Fire & Rescue received 30,578 9-1-1 calls; approximately 85% or 26,000 of these calls were medical in nature. Of these calls, 36% or 9,300 calls were non-urgent. These statistics, combined with the recent adoption of the Affordable Health Care Act by the federal government, led the agency to focus on an Integrated Mobile Health Care model, and the implementation of this pilot program, with the goal of providing the best emergency medical service at an appropriate response level. This innovative program was designed by Anaheim Fire & Rescue with participation from Kaiser Permanente Orange County, Care Ambulance Service, and Metro Cities Fire Authority (Metro Net) in coordination with Orange County Emergency Medical Services. Dr. Gary A. Smith, a California licensed physician, who also provides physician oversight for the Mesa Arizona Fire & Medical Department, serves as the physician consultant for Anaheim’s program. Mesa Arizona implemented a similar program two years ago which resulted in millions of dollars in cost savings as well as enhanced patient care. When a Metro Net Emergency Medical Dispatcher receives a call, they will follow a pre-approved protocol to identify non-emergency patients who may benefit from the definitive care of a nurse practitioner and dispatch the CCRU unit. Upon arriving at the patient’s location, the CCRU will provide an on-site evaluation, treatment, coordination of care, and/or referral to the patient. A paramedic engine/truck level response can be requested any time the CCRU crew feels the patient would benefit by being transported to a hospital’s emergency department. Conversely, the CCRU crew could be called upon if, after a paramedic assessment, the paramedic believes the patient would benefit from the care of a nurse practitioner. The pilot program will operate through June 2016 with a budget of $500,000; $210,000 of which was provided by Southern California Permanente Medical Group. Anaheim Fire & Rescue funds the remainder of the program. During the first three months of this pilot program, Anaheim Fire & Rescue will respond with the CCRU together with the traditional emergency deployment of a paramedic crew and ambulance. For more information on Anaheim Fire & Rescue, please visit www.anaheim.net/fire.